THE EXPECTATIONS FOR CHANGE in U.S. policy toward Latin America when Barack Obama was elected president seemed as high among most governments and citizens of Latin America as the expectations of the voters in the United States who cast their ballots for him. Many analysts believed that the relationship between the region and the United States had reached a new low point during the two terms of Obama’s predecessor, President George W. Bush. While the most popular explanation for that outcome emphasized the "neglect" of or the "forgotten relationship" with Latin America, that neglect explanation understates the importance of both the Bush administration’s activities in Latin America and the actions of Latin American people and governments in creating the situation that confronted the newly elected President Obama. Bush administration officials did seek to influence political and economic developments in ways that would maintain regional hegemony for the United States, but they were unable to do so as easily as the U.S. government had in the past. When Barack Obama took office in January 2009, he confronted a much different situation in Latin America from what his predecessor had faced eight years earlier. In 2001, a fading Fidel Castro in Cuba, and Hugo Chavez, whose position in Venezuela was somewhat tenuous, were the only Latin American presidents who might be described as challenging U.S. influence from the left. Eight years later, Chavez was far more secure, a Castro-headed government was enjoying a resurgent relevance in the region, and they had been joined in office by enough kindred spirits to constitute what many described as a "red tide." Russia, China, and Iran were wandering around the region, and, for the most part, the leaders of all three of those countries were more welcome in Latin American capitals at the end of 2008 than the outgoing U.S. president. The United States was also being challenged by new regional organizations and meetings, from which the colossus of the north was deliberately excluded. As I noted above, the most popular explanation for those developments was that the United States was understandably preoccupied with developments elsewhere in the world. At war in both Afghanistan and Iraq, and concerned with potential security threats in Iran and North Korea, it would not be surprising that the focus on the Middle East and Asia would take attention away from Latin America. While there was a diversion of energy and resources toward the Middle East and Asia, Latin Americans did continue to experience the heavy hand of the empire to the north. The Bush administration responded to the rise of the Latin American left with threats (in Bolivia, the Ambassador’s words clearly backfired and helped to garner support for Evo Morales during his presidential runs), by working with opposition groups (in Venezuela, the support by US officials for those implementing the 2002 coup was clear, even if any actual US role in the coup is more difficult to determine), and by attempting to separate the "good left" from the "bad left" in a divide and conquer sort of strategy (Lula in Brazil was the good, pragmatic left, while Chavez was the classic bad, populist left). The Bush administration also continued to advocate economic neoliberalism, deregulation, and free trade orthodoxy as the one size fits all solution for the region’s economies. Finally, there was a security or even terrorism framing put on contentious issues such as drug trafficking and immigration. The combined militarizing of our relations with the region, political interventions, and efforts to impose its preferred version of free market capitalism throughout the region add up to what Greg Grandin described at one point as "new imperialism" in Latin America. The concept of imperialism has made a comeback of sorts over the last decade. What is particularly interesting is that the idea of empire is openly engaged by both the advocates of a robust U.S. military presence around the world and the critics of the same activities. As the title of this article suggests, I believe that the Obama administration has continued with the imperial policies of the Bush administration, although they have accompanied those policies with a much different tone and far more conciliatory rhetoric. In effect, we are now the sort of "good neighbors" who shake hands and exchange pleasantries even with those we don’t like very much, but we clearly remain committed to asserting economic and political power in the area. The actual period of the good neighbor policy in United States relations with Latin America is sometimes seen as a break from the overall U.S. strategic interests in exerting control over the region. But in practice, the withdrawal of U.S. troops from the region in the early 1930s coincided with support for dictators and oligarchies in many of the same countries that we had previously occupied. As long as those governments supported U.S. geopolitical and economic interests, we would keep our troops at home. Underneath the change in appearance and discourse, an implicit imperialism continued to characterize U.S. policy. In the rest of the article, I will first make the argument about continuity from Bush to Obama, starting with Cuba, a country toward which there seems to have been some policy change. The case of Honduras provides a particularly instructive example to test how the Obama administration responded to an extra-constitutional removal of an elected leader, who had become allied with the "bad left" in Latin America. On the other side, relations with Colombia seem to suggest at least continuity with the aggressive policy of military support to the most consistent U.S. ally in South America. Next, the approach to "intermestic" issues such as immigration and drug trafficking by the two administrations will be assessed. Finally, relationships with Brazil and Venezuela will be discussed. In the concluding section of the article, I will offer a few possible explanations for the continuity between the two administrations. WHILE RUNNING FOR PRESIDENT, Barack Obama did not give a lot of attention to the region of Latin America. The most important speech he gave was on May 23 before the Cuban American National Foundation in Miami, Florida. Unfortunately titled, "Renewing U.S. Leadership in the Americas," the speech directly criticized the Bush administration record in the region and offered some general ideas about what his administration would do differently. Obama describes the Bush approach: "…its policy in the Americas has been negligent toward our friends, ineffective with our adversaries, disinterested in the challenges that matter in peoples’ lives, and incapable of advancing our interests in the region." The basic problem then was that negligence and disinterest did not allow us to "lead the hemisphere into the 21st century," but when Obama becomes president, "We will choose to lead." "It’s time to turn the page on the arrogance in Washington and the anti-Americanism across the region that stands it the way of progress." If "we leave the bluster behind," then "we can renew our leadership in the hemisphere." As some analysts have suggested about the Obama campaign more generally, it was easy to read into the message of "change" whatever sort of shifts from the Bush years that one could imagine wanting. In terms of foreign policy, when Obama said that he would meet with people such as Ahmadinejad, Castro, and Chavez without preconditions, it wasn’t a reach to assume that he would surely want to lift the embargo with Cuba too. Or as a person of color with recent family immigration experiences, surely he would move quickly on the immigration reform issue. And when he told those of us in places such as Ohio and Pennsylvania that he wanted to renegotiate NAFTA, we could imagine that he was ready to move beyond free trade orthodoxy in Latin America. A careful reading of his limited legislative record as a senator and his campaign speeches would have given pause to those expecting dramatic changes in U.S.-L.A. relations. In that Miami speech, he directly said that he would keep the embargo with Cuba in place. On immigration, while he had co-sponsored the DREAM Act (to provide a path to citizenship for those who had come to the US as children), he had also voted for the Secure Fence Act, which authorized building several hundred more miles of wall between the United States and Mexico. And the renegotiation of NAFTA was not because he recognized the harm being done to Mexican peasants or workers, due to both the agreement and unfair US trade practices, but rather to somehow bring manufacturing jobs back to the rust belt. PRESIDENT OBAMA’S INITIAL APPOINTMENTS to key foreign policy posts suggested the possibility of continuity with the Bush and Clinton administrations. Secretary of Defense Gates was asked to continue on from his work for President Bush, and Secretary of State Clinton showed Obama’s likely comfort level with the foreign policy approach of the last Democratic president. President Bush’s Assistant Secretary of State for Western Hemispheric Affairs, Tom Shannon, continued in that position until he was nominated by Obama to be the U.S. Ambassador to Brazil. Arturo Valenzuela, who became the Assistant Secretary of State for Western Hemisphere Affairs, was one of the authors of Plan Colombia when he worked in President Clinton’s administration. Jeffrey Davidow, who came out of retirement to serve as White House Advisor to the Summit of the Americas, had a Chilean embassy position at the time of the Allende overthrow, and he served the Clinton administration as Ambassador to Venezuela and Mexico, as well as Assistant Secretary of State for Inter-American Affairs. The former Ambassador’s known positions on trade, the drug war, and Cuba did not suggest that his pre-summit counsel would be in the direction of significant policy change toward Latin America. Before leaving for his first summit with Latin American leaders in Trinidad and Tobago, only a few months after taking office, President Obama announced that he would end the Bush administration-imposed policies of limiting remittances and travel by Cuban Americans to the island. The announcement of the change for Cuban Americans was clearly timed to preempt the universal criticism that the United States would be getting for the embargo at the Trinidad and Tobago summit. That embargo lacks any global support as indicated by the yearly UN resolution that condemns the policy. The 2010 vote was 187-2, with only Israel joining the United States. Israel casts a vote with the US, but it maintains trade and investment with the Cubans. For a president who promised that multilateralism would replace his predecessor’s unilateralism, it would be hard to rationalize being on the losing end of a 187-2 vote as part of a commitment to cooperate rather than go it alone. Latin American media previews of the meetings consistently mentioned that the one thing Obama could do to indicate real change in U.S.-L.A. relations would be to lift the embargo. A year after the summit, President Obama’s Secretary of State, Hillary Clinton, was asked about the embargo, and she gave an interesting answer: "It is my personal belief that the Castros do not want to see an end to the embargo and do not want to see normalization with the United States, because they would lose all of their excuses for what hasn’t happened in Cuba in the last fifty years." So, the country’s top diplomat seems to understand that the United States currently has the policy preferred by the government that we are trying to weaken, and yet the Obama administration is unwilling to change the policy. Instead of change, we have seen the Cuban government listed as a "state sponsor of terrorism"; and the United States continues to provide funds for Cuban dissidents by way of quasi-governmental organizations. That last practice led to the arrest of Alan Gross who after entering Cuba on a tourist visa, was apparently working for Development Alternatives, Inc., a subcontractor of the State Department, with the assignment of providing satellite communications equipment to Cuban dissidents when he was arrested in December 2009. Adding to the costs for the U.S. government of such a policy, the Cuban government is able to discredit its civil society opponents who receive such financial assistance as U.S. government "mercenaries." For good measure, the Obama administration designated Cuba (along with Iran, Sudan, and Syria) as a state sponsor of terrorism, subjecting anyone from Cuba or traveling through the country to enhanced security checks. In January 2011, Obama took another step toward loosening the travel ban along the margins, but most U.S. citizens will still not be able to travel to the island, and the embargo remains as firmly in place as ever. At the April 2009 summit, President Obama’s interactions with Venezuelan President Hugo Chavez received the most U.S. media attention. After first shaking the hand Chavez offered him, President Obama then accepted a book by Eduardo Galeano that the Venezuela leader gave him the following day. It is likely true that President Bush would not have let himself get in that situation, but it is hard to imagine that President Obama had any other option than to accept the offered hand and book. In general, the rhetoric between Caracas and Washington has been toned down since the Bush years, but no substantial change in policy is apparent. With Bolivia, another country on the "bad left," Obama has also continued with Bush era policies. At the end of June 2009, the United States permanently eliminated Bolivia’s trade preferences, which had been temporarily suspended by President Bush. President Evo Morales responded by accusing Obama of having "lied" in Trinidad and Tobago. The expectations had been quite high at the beginning of the summit that the Obama presidency would bring about reduced tensions among the United States and the Latin American left, but certainly policy toward Cuba, Venezuela, and Bolivia did not change markedly over the first several months of the new president’s term. The next major test for the Obama administration came only a couple of months after the summit, when President Zelaya was removed from his office by the Honduran military early in the morning and flown out of the country (with a stop at a U.S. base in the country for refueling). The initial response by the Obama administration was to describe the removal as illegal and to call for the suspension of the country from the OAS, suggesting that they might have learned from the Bush administration’s acceptance of the 2002 military coup that temporarily removed Chavez from power. Still, almost all of the U.S. aid to Honduras continued to flow, members of the Honduran military continued to train at the renamed School of the Americas at Fort Benning, Georgia, and the U.S. Ambassador stayed in Honduras. Over time, the U.S. rhetoric clearly changed, and U.S. statements and actions pushed the Obama administration away from the widespread Latin American resistance of the post-coup government’s legitimacy. A little more than a week before the November 29 elections, the United States signaled that it would accept the outcome of the election. Although Panama took a similar stand at the time, that position had not been publicly taken by any other government in the Americas before the United States did so. Others, such as Colombia and Costa Rica, recognized the new Lobo government in Honduras soon after the election was held, but the United States was not part of the region’s mainstream. There was considerable domestic pressure on Obama to move in that direction – whether from paid Honduran lobbyist and former Clinton administration official, Lanny Davis, or from Bush administration official, Roger Noriega, or perhaps most effectively, South Carolina Senator Jim Demint who put a hold on the confirmation of Obama’s Latin American team until it was clear that the United States would recognize the new government. 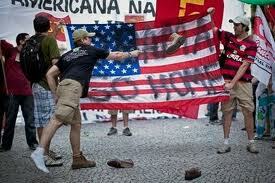 In the analysis of one Argentine diplomat: "Obama has decided that Latin America isn’t worth it. He gave it to the right." That likely overstates somewhat the Obama administration’s actual differences with the position of the Republican right on Honduras. But still, in what was arguably the most important Obama administration decision about U.S. policy toward Latin America to that point, the choice is either to believe that he caved in the face of pressure from a South Carolina Senator or that he was more than willing to move on as if a military coup in Honduras had never happened. Secretary of State Clinton’s rhetoric suggested that she was generally comfortable herself putting pressure on Latin American governments who challenged the United States. At the end of 2009, she offered a not very veiled threat to Latin American countries who were developing relations with Iran: "I think if people want to flirt with Iran, they should take a look at what the consequences might well be for them. And we hope that they will think twice." The Obama administration went on record as telling countries in the region – not just Venezuela, Bolivia, or Cuba had diplomatic ties with the Iranians, but the Brazilians did as well – that they should expect significant costs if they did not follow the U.S. foreign policy line in that case. At the end of 2009, the Obama administration showed quite clearly that their approach to Colombia would be more of the same as well. In this case, that meant that President Obama signed an agreement in October 2009 giving the US access to seven bases in the South American country to replace the access in Ecuador that ceased when the ten-year lease at Manta was not renewed by the Correa government. From the perspective of regional leaders such as Chavez and Lula, there were a number of problems with that decision. First, there was no evidence of consultation by the U.S. government with Colombia’s neighbors, including Brazil. The secretive bilateral agreement with Colombia did not seem consistent with the words of a U.S. president committed to a new era of cooperation with his neighbors. Complicating things even more, the Venezuelans were able to report that a U.S. Air Force document said that the use of the base in Palanquero, Colombia, "…provides a unique opportunity for full spectrum operations in a critical sub-region of our hemisphere where security and stability is under constant threat from narcotic-funded terrorist insurgencies, anti-US governments, endemic poverty and recurring natural disasters." In this case, not only does the Obama administration seem to be fully supportive of the military solution to drug trafficking, but the wording here suggests that the empire believes in military solutions to both poverty and anti-U.S. sentiment. The language was eventually removed from the document, but the damage was done. Besides Colombia, the most consistently pro-U.S. government in the region has been Mexico. The issues of contention between the United States and the bordering country have included immigration, drug trafficking, and trade. President Fox, who was in office from 2000-2006, was particularly disappointed in President Bush’s unwillingness to use political capital on a comprehensive immigration reform, even though the former Texas governor had consistently offered rhetorical support for the policy. When President Calderon succeeded Fox, he initiated a more aggressive and militarized challenge to drug traffickers in Mexico. The U.S. government passed the Merida Initiative, which was occasionally described as a "Plan Mexico," given its similarity to the Colombian drug policy. In the area of trade, the Mexican government has long argued that Mexican truckers should be allowed to transport goods to U.S. destinations, and had sought the elimination of some barriers to the sale of Mexican foodstuffs in the United States. In the case of the "drug war" in Latin America, the Clinton to Bush to Obama continuity is very clear. New words from the current U.S. president were initially well received south of the border. In a joint press conference in Mexico with President Calderon, President Obama said that, "A demand for these drugs in the United States is what is helping to keep these cartels in business. The war is being waged with guns purchased not here, but in the United States." While he acknowledged the shared responsibility, President Obama did not alter the U.S. policy in any significant way. Through the Merida Initiative, we continue to arm the militaries of Mexican and Central American governments, ensuring that from Colombia to the U.S.-Mexico border, the primary U.S. role is to provide additional arms to militaries with dismal human rights records. At the same time, the logical policies that would flow from the Obama rhetoric – renewal of the assault weapons ban or redirection of resources to the demand side – have not been enacted. It is much easier politically to provide the Mexican military with Blackhawk helicopters than it is to take on the gun lobby or implement effective drug rehabilitation services in U.S. prisons. In response to the criticism from the gun lobby, the Bureau of Alcohol, Tobacco, Firearms, and Explosives (ATF) even stopped releasing statistics on the percentage of weapons seized in Mexico that had been purchased in the United States. President Obama suggested during the campaign that he would support comprehensive immigration reform, as had his predecessor. As president, Obama has appointed dozens of Latinos to important positions in his administration, and the nomination of Sonia Sotomayor to the Supreme Court was an important statement. But in the two years that he has been in office, the substantive policy changes from the Bush years have actually been in the direction of more troops and agents on the border, and an increase in deportations during each of the two years. Secretary of Homeland Security Napolitano announced in October 2010 that in addition to the record number of deportations, the Obama administration had audited more employers suspected of hiring illegal labor in their first 20 months than the Bush administration had during its entire time in office. On the other hand, the Obama administration did voice its displeasure with the SB 1070 legislation passed in Arizona, and the Attorney General has pursued a legal challenge to the state’s rights to implement that sort of immigration policy. But overall, a president who voted for the Secure Fence Act when he was in the U.S. Senate has generally not deviated from the Bush administration approach. The nicer words for our neighbor cannot mask the ongoing policy of coercion – walls, deportations, and the creation of a hostile enough environment that will lead undocumented people to choose to leave on their own. One of the most popular presidents in the world, much less the Americas, was Lula da Silva in Brazil. President Bush maintained friendly enough relations with Lula, but it was clear that during the years both were in office, the Brazilian president was increasing his influence, while the U.S. president’s influence was receding. Lula played a role in the development of regional organizations, effectively dealt with Chavez in Venezuela, renewed a friendship with the Castros in Cuba, worked together with "emerging powers" China, Russia, India, and South Africa, and forcefully challenged the US on issues of fair trade. While President Obama seems to have developed a friendship with the outgoing Brazilian President, his administration does not seem to have figured out a strategy for dealing with the country. Lula exchanged visits in 2009-2010 with President Ahmadinejad in Iran, he rebuffed Secretary of State Clinton’s request for support in the UN for sanctioning Iran, and in May, 2010 he and Turkish Prime Minister Erdogan negotiated a commitment from the Iranians on their nuclear programs that is said to have made the Obama administration "furious." In December, 2010, the Brazilians and the Argentines recognized the state of Palestine, in what was both a response to the Obama administration’s officially ending the attempt to negotiate a temporary settlement freeze in the West Bank and another statement about the willingness of important countries in Latin America to take stances on international issues that are unwelcome in Washington. The worst relationship the Bush administration had with a Latin American leader was certainly with Venezuelan Hugo Chavez. In an interview on a Spanish-language television station during the week before Obama was inaugurated, the incoming U.S. president noted that Venezuela was "exporting terrorist activities" and generally "hindering progress in the region." It is curious that Obama would unnecessarily start to make arguments about Chavez that sound a lot like those of Bush and his Secretary of State, Condoleezza Rice. It is hard not to conclude that the Obama administration has the same goal as the previous administration of isolating the "bad left" in Latin America. According to Eva Golinger, the National Endowment for Democracy (NED) provided almost $2 million to opposition groups in Venezuela during 2009, more than double the amount from the last year of Bush’s presidency. Both the Bush and Obama administrations tried to discourage the sale of arms to Venezuela with the argument that they could end up in the hands of Colombian rebels, but neither US president had much success on that front. Rather than any direct U.S. policy, it appears that the biggest challenge faced by Chavez is due to the lingering economic problems in the country. While Chavez and the Obama administration have generally steered clear of the name-calling on both sides that characterized the Bush years, there are signs that the Venezuelan president’s patience might be wearing thin. In December 2010, Chavez confirmed that he would not accept the appointment of Larry Palmer as the Obama administration’s Ambassador to his country. Palmer had made "disrespectful" comments about Venezuela in email responses to questions from Senator Richard Lugar as part of the confirmation process, and those replies were then posted on the Indiana Republican’s website. The Venezuelan President said that Palmer would be detained at the airport and sent home should he try to enter the country. THE OVERALL POLICY CONTINUITY would be understandable if U.S.-L.A. relations were at a good place when President Obama took office. But given the nearly universal sentiment that relations were at a low point, the failure to shift course begs for an explanation. We are left first with the possibility that in the case of Latin America, Barack Obama’s worldview is similar to his most recent predecessors’. Their "leadership" in the Americas includes aid and encouragement to those who oppose governments on the left; an economic embargo and prohibition of travel to Cuba by nearly all U.S. citizens; a militarization of drug policy and a security-first approach to immigration; and attempts to provide open access for U.S. investors and goods in Latin America. President Obama may simply share a set of beliefs about Latin America held by at least the post-Cold War US presidents. As a supplement to that idea, we might return to the idea of regional neglect. In that scenario, President Obama has been distracted by an ongoing economic crisis and more pressing foreign policy concerns in other parts of the world. So, without the time and energy for transforming Latin American policy, the default is continuity. But just as with the Bush years, there were certainly policy decisions being made – the Honduran coup, bases in Colombia, Bolivian trade preferences, and increases in deportations – that suggest it’s not neglect, but rather how the Obama administration engages the region that is the problem. A second set of explanations would focus on the impact of U.S. domestic politics on foreign policy toward Latin America. With many of the contentious issues having both international and domestic political implications, significant Latino ethnic interest group activism present in the United States, and the lack of real military or hard security threat in the region, policy toward the rest of the Americas seems particularly open to domestic political calculations. In that case both Bush and Obama may be affected by similar political pressures; therefore, we get similar outcomes. Presidents from both parties after all want the support of U.S. agro-industry, which continues to be both heavily subsidized and then protected on the rare occasion when the Brazilians or another Latin American producer is still too competitive. Presidents from neither party seem willing to risk the potential loss of Electoral College votes that might result from challenging an anachronistic embargo that is still supported by many Cuban Americans in South Florida. Defense contractors have the same interest in securitizing drugs and immigration, and corporations want the government to protect private property in Latin America when nationalizations and expropriations are put on the agenda, regardless of who is in the White House. In the end, we may really be left here with yet more evidence that the US policy toward Latin America is embedded in larger structural forces that mean partisan differences in policy are usually more symbolic than real. The Caribbean is supposed to be "America’s lake," Latin America’s resources should be available for U.S. investors, and this is a region in which we are meant to lead. Regardless of who holds the presidency, the United States has expectations for the region – sign free trade agreements or eradicate coca crops – and it tries to cajole or coerce Latin American governments to fall into line. Control over Latin America was among the earliest U.S. foreign policy goals, and it has really never changed. The current U.S. president is still more popular in the region than his predecessor, and his administration’s language is somewhat more measured when he deals with anti-American sentiment, but in the end, he’s still the leader of the "Colossus of the North." The change is really in the South, where resistance from Bolivian social movements and Brazilian or Venezuelan presidents is making it clear that the United States is no longer able to dictate policies in the region. Compounding the problem for the U.S. president is that the economic and ideological resources at his disposal are shrinking, and the competition from China and others outside the region is increasing. While Obama faces a situation in the region made more difficult as a result of the Bush policies, we continue to see evidence of a similar overall approach to the region. The training of Latin American military personnel in the United States continues – at the renamed School of the Americas (Western Hemisphere Institute for Security Cooperation), much of the focus post-Cold War is on preparing those troops to fight against drug trafficking. The Central American corridor linking Mexico to Colombia is increasingly well stocked with U.S. military resources and U.S.-trained troops. The proposed access to seven bases in Colombia and the increasing militarization of the US-Mexico border add to the security effect. Finally, free trade agreements with Mexico (NAFTA) and Central America (CAFTA-DR), as well as those awaiting ratification with Colombia and Panama, effectively marry U.S. military power to economic interests in a way that would be familiar to past critics of U.S. imperialism in the Americas. President Obama has not aggressively pushed ratification of the trade agreements with Panama and Colombia to this point, but with the Republican pickup of seats in the 2010 election, he will have a new opportunity to extend the economic component of that security corridor further into the region. White House Press Secretary Robert Gibbs slammed the "professional left" in an August 2010 briefing for their criticism of President Obama: "I hear these people saying he’s like George Bush. Those people ought to be drug tested." He went on to suggest that the left wouldn’t be satisfied until "we’ve eliminated the Pentagon." While it is tempting to respond with a sarcastic comment about how easy access to those drugs is guaranteed as long as the U.S. government bases its drug policies in the Pentagon, the argument here is that when it comes to Latin America, the "professional left" should feel free to argue that Obama is much more "like George Bush" than not. While he is still somewhat more welcome in Latin American capitals than his predecessor, that’s largely because he is a more soft-spoken neighbor, not because he holds different views about the neighborhood itself. Given how big the opening left him by President Bush, Obama’s failure to reshape the U.S. approach to Latin America is all the more shameful. 1. Greg Grandin, Empire’s Workshop: Latin America, the United States, and the Rise of the New Imperialism, (New York: Metropolitan Books, 2006). 3. During a July 2008 trip to Cuba, for example, I visited a large Israeli citrus farm just outside Havana that was a joint venture with the Cuban government. 5. Of the 14 countries on the full list to get enhanced screening (the other ten were described as "countries of interest"), Cuba is both the only country in the Western Hemisphere and the only one without a significant Muslim population. 6. Greg Grandin, "Muscling Latin America," The Nation, February 8, 2010.